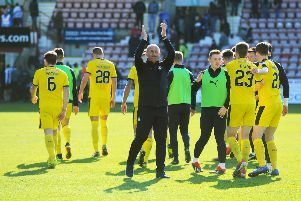 Falkirk fans’ support on Sunday – and throughout the season – has been praised, and it will be rewarded by the club in the new season ticket prices. The club will freeze the price of season books for the FIFTH straight season for the Navy Blue Army who packed out Rugby Park’s away end for the SPFL Premiership play-off final on Sunday. They saw a humbling 4-0 defeat for the Bairns, but stayed behind to cheer the side off at the end of an incredible season. The club’s managing director Ronnie Bateman told The Falkirk Herald: “The support was phenomenal and unlike anything many of the players have witnessed. John Baird commented to me he’d never encountered a crowd like Sunday. “But it wasn’t a one-off. The support and backing for the players and the club has been phenomenal all season. The away crowd was also praised by Raith Rovers who tweeted commendation of the team’s ‘exemplary fans’. Peter Houston too, paid them plaudits but was tinged with regret. The boss said: “I’m sad we couldn’t give them a performance they deserved. We had an off-day. Houston will hold their hopes again next season in the SPFL Championship. They will meet Hibs, Dunfermline, Raith Rovers, Ayr and Dundee United among others in next season’s league. Renewal packs will be delivered to existing seat holders this week, and tickets are on sale from 9.30a.m. on Wednesday, June 1.